I love making natural beauty products as gifts, and homemade body butter is one friends and family always love to receive. It’s a gift that is easy to personalize with custom natural scents (and even can help with sleep if you add a little magnesium!). Put the finished product in a cute glass jar with ribbon and a tag, and you have a thoughtful and beautiful gift that will make them feel pampered for months. Even if you aren’t typically the type to make your own gifts, this recipe is easy for DIY beginners and fun to make. Give it a try! Body butter is thicker than lotion and contains less water. This means it takes longer to penetrate the skin (don’t walk on a floor barefoot after applying body butter to your feet!) 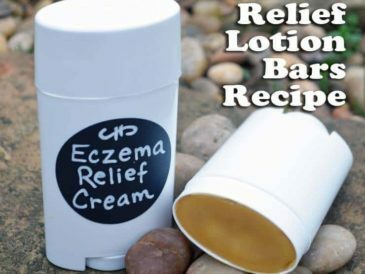 but it’s very moisturizing and softens even those tougher, very dry spots like the knees, elbows, and feet. 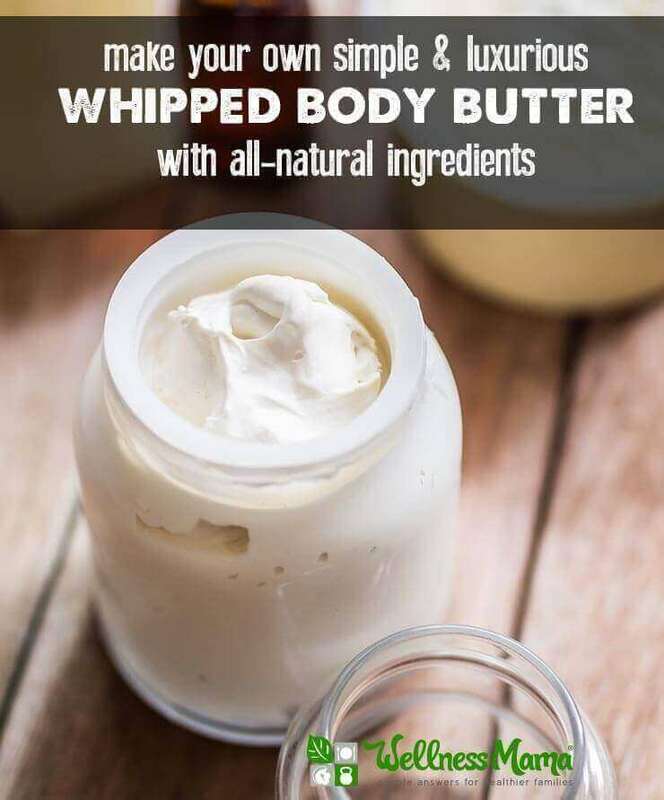 By whipping body butter, you get the best of both worlds since it is soft and easy to apply but still extra moisturizing. 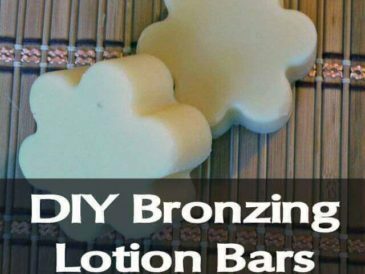 This new recipe has similar ingredients to these homemade lotion bars, but removes the beeswax and whips the mixture as it cools to create a cloud-like lotion that is extremely nourishing! 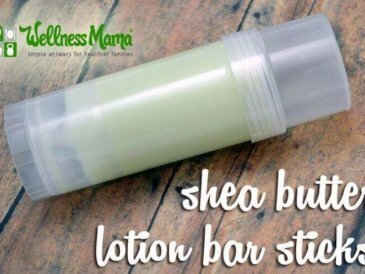 This body butter is great for babies or sensitive skin, and scents can be added to make it a custom gift for anyone (or to keep for yourself!). My current favorite is a peppermint-scented version for the holidays, but I also like a citrus/lavender combination. The combination of shea and cocoa butter with two nourishing oils makes a highly moisturizing combination, but whipping the mix helps it go on smoothly without being oily. Optional: Cocoa butter, shea butter, and mango butter are all interchangeable in this recipe. If you only have one or two on hand, feel free to substitute or play with different proportions. In a double boiler or glass bowl, combine all ingredients except essential oils. Remove from heat and let cool slightly. 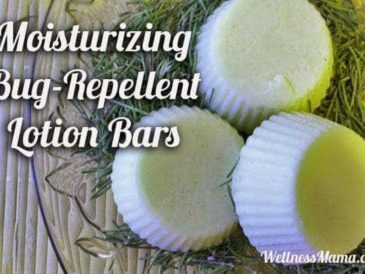 Add essential oils if using. Move to fridge and let cool another hour or until starting to harden around the edges but still somewhat soft. Return to the fridge for 10-15 minutes to set. Keep for yourself, or give away! Enjoy! Body butter is definitely more emollient and has a heavier texture than lotion does, but after a few minutes it will penetrate the skin and lose any greasy feel. Stored away from moisture and light this homemade body butter should last 6-8 months. Using a spoon or spatula to dip rather than your fingers will extend the life of the body butter. 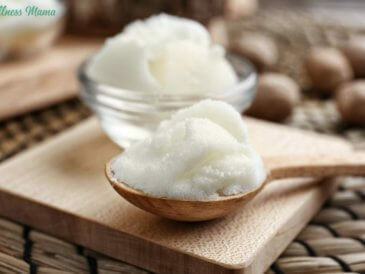 Shea butter especially can vary in texture and color depending on the brand. Not to worry, it will still work just as well! Nope! This body butter actually did wonders on my cystic acne back in the day. Vanilla Mint Chocolate Massage Butter – Perfect for a couples’ at-home massage! Orange Blossom Body Butter – I’ve been dying to round up the ingredients for this recipe and try it out. Three Kings Christmas Body Butter – For an extra-special holiday gift, use the base recipe above and add 10 drops each of frankincense and myrrh essential oils plus 1 teaspoon gold mica powder. 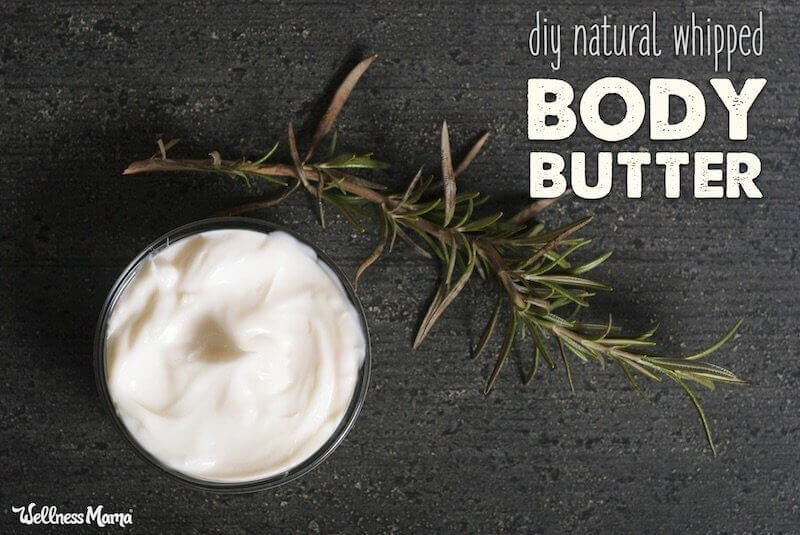 Ever made your own body butter? Want to try this recipe? Share below!